Hippias of Elis, a fifth century BC sophist, was the first to compile the initial victor list of the Olympic Games. According to him, the first athletic contest, the foot race, was held at Olympia, in Western Peloponnese, for the first time in 776 BC, in honor of the Olympian Zeus. Later ancient sources inform us that the Olympic festival gradually gained considerable importance and was ranked among the largest and most famous Panhellenic festivals by the time of early fifth century. Nevertheless, the Olympic Games were not the first athletic events to be organized in the Mediterranean area. Ancient Egyptians and Mesopotamians had a long tradition in athletic activities as shown by the reliefs depicting athletic scenes carved on the tombs of their kings and their nobles. They did not organize regular festivals however and when they did, these were most likely reserved to kings and higher classes. The Minoans were particularly interested in the gymnastics. Bull-leaping and tumbling were their favorite sports as indicated by the frescoes decorating their palaces. Other Minoan sports included track contests, wrestling and boxing. But it is most likely that such activities were performed near the palace, probably by members of the higher class. 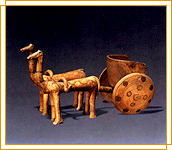 The Myceneans adopted all Minoan games and introduced chariot racing and more track events. In the Mycenean world the chariot was considered extremely important, as it is not only used in hunting and in war but for religious and funerary ceremonies as well. The Homeric poems comprise the first written evidence of athletic contests in the Greek world. In the Iliad and the Odyssey, Homer includes vivid descriptions of the athletic contests held either as a part of funerary ceremonies in honor of the dead hero, Patroclus or, in other occasions. The emergence of the first city-states led to the rapid development of athletics. Numerous regional games were set in the cities and took place during festivals of religious character. Athletics became an institution, thus becoming the pretext for recurring competition among the members of the polis. It was not long before Olympia became an important religious center where a series of athletic events were held. These events were to become the symbol of political and cultural unity of the Greeks in the historical period. Some of the most important buildings in ancient Olympia rendered in three-dimensions. 3D reconstruction of the Temple of Zeus in ancient Olympia.